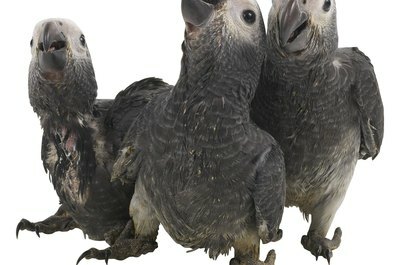 Captive-born African greys are less likely to have worms. 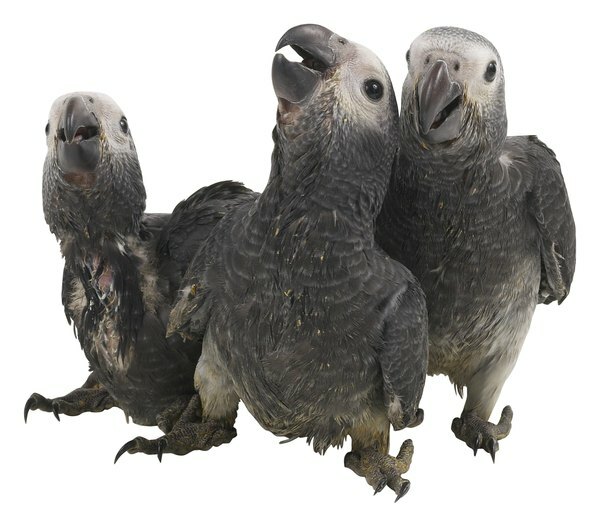 It might come as a surprise, but African grey parrots, like many cockatoos and finches, can become infested with intestinal worms. It is far more likely in African greys born wild. Captive-born birds usually do not come in contact with food sources that introduce worms to their systems. Various types of roundworms can develop in most pet birds, including African greys. Wild birds can transmit certain roundworms to parrots housed outdoors -- particularly in warm, muggy climates -- by introducing or dropping foods infected with roundworm eggs. According to "The Merck Manual for Pet Health," signs of roundworm infection include weakness, lethargy and emaciation. If left untreated, roundworms can be fatal, as they can block the intestinal tract. Tapeworms are common among wild parrots but are less so in pet birds because most are bred in captivity. Tapeworms are transmitted either through bites by infected critters such as spiders by the parrot eating food infected with tapeworm eggs. According to Merck, there are rarely outward signs of infection apart from occasional tapeworm segments found in droppings. Recurrence is rare unless the bird remains exposed to the creature that infected it through a bite. Worms are only one type of parasites that infect African greys. Giardiasis, a parasite that can cause diarrhea, severe itching and malnutrition, can infect African greys, though it is not common. Symptoms may include screaming or plucking feathers. Trichomoniasis is the result of another parasite that leaves whitish-yellow lesions on the lining of the mouth and throat, crop and esophagus. Trichomoniasis typically infects budgies, but can in rare cases occur in parrots. Both conditions, like worms, typically stem from ingesting contaminated food or water. Only a veterinarian can treat roundworms or tapeworms in African greys. For tapeworms, she will test your bird's droppings for signs of infection. Depending on the degree of the infection, the medicine can be given orally or injected, according to PetMD website. Usually, more than one dose is needed to completely remove tapeworm parasites. Oral medicines are typically given for roundworm infections. The safest way to avoid worms in your parrot is prevention. Have him periodically checked by your vet. Can You Get Worms From Your Cat or Dog? "Small, Friendly Types of Cichlids"